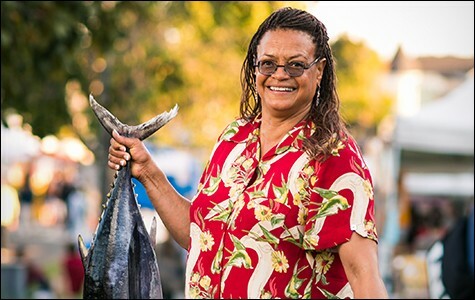 Yvette Hudson catches fish year-round by hook and line. The seafood counter of a local supermarket can bewilder even the savviest of diners. The labels can be confusing, freshness can be questionable, and the person behind the counter may not know any more about what's inside the case than the customer. Mislabeling confounds further. According to a recent study by Oceana, the largest international ocean conservation group, up to 38 percent of fish in retail outlets is mislabeled. Think you're buying halibut? You may be buying mercury-laden Pacific tilefish. And the "wild" salmon at the supermarket? Unsustainably farmed. Questions about toxicity levels in fish are another source of confusion. For example, recent news of Fukushima Daiichi's continuing radioactive waste leakages sparked fearmongering here in the United States, though the latest research deems domestically caught fish still safe. But conclusions about seafood safety fluctuate, requiring consumers to keep up on the latest news and studies. In a local food culture that prides itself on knowing that its cabbages are pesticide-free and that its chickens were pasture-raised, it's often difficult to tell where our fish comes from. So what's a pescetarian to do? We tracked down a few companies who can tell you exactly who caught your fish, how it was caught, and when. On their 44-foot salmon boat, the Cash Flo II, Mike and Yvette Hudson are at sea year-round, catching salmon, albacore tuna, and California halibut by hook and line — no destructive trawling nets, which drag along the ocean floor. The fish are gutted and chilled down to 32 degrees within an hour of being caught, which means the company's albacore tuna is sashimi-grade. In winter, Hudson offers Dungeness crab. Hudson Fish began selling its wares at farmers' markets ten years ago. 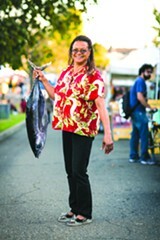 "When farmed salmon got introduced [into the market]," said Yvette, "the price of wild salmon dropped to the floor. We decided if we wanted to keep fishing, we needed to get retail dollars." The two serve as directors on the board of the Small Boat Commercial Salmon Fishermen's Association, which is a member of SalmonAid, an advocacy group that works to promote sustainability of salmon fishing. And as to the freshness of their fish: "You can't get it any fresher," said Yvette. "Most commercial fisherman go out for three days, and the fish are processed on the fourth day, which means that the fish at the fish market is around six days old." Hudson's catch is no more than four days old. Fish caught Monday through Wednesday goes to the Thursday farmers' market in North Berkeley; fish caught on Thursdays and Fridays finds its way to the weekend farmers' markets in Kensington, Downtown Berkeley, and El Cerrito. Pre-orders can be also be made; for more information, go to HudsonFish.com. During crab season, Will Ward, owner of Carapace Fishing, also sells Dungeness at local farmers' markets. A part-time fisherman, Ward docks his boat, a converted sportfishing boat called the Nola Mae, at the Berkeley Marina. Because his boat is small, he does something many commercial crab fishermen don't do: He sells his crab off the dock. "If you're a big boat with 200 to 250 crab pots, you might wind up with so much crab the only way you can sell it is with a wholesaler. There's no way you're going to be able to move it by going straight to market." His smaller catch allows him to sell it while it's still fresh, and quickly return to sea to catch more. Most of his crab is caught within eyesight of Stinson Beach, using crab pots. The crab is sold live to restaurants and to nearby farmers' markets. Typically, the crab he sells is no more than a day old. "They're lively," said Ward. And when they're lively, they taste better. Carapace can be found at the South Berkeley and Temescal markets in the East Bay, as well as in Union City and Santa Clara, starting in mid-November, the beginning of crab season. Ward uses Twitter and Facebook to announce off-the-dock sales. Online direct sales are available through GoodEggs.com. Ward's crab can also be purchased through Fair Share CSF, which works much like community-supported agriculture, in which customers directly support local fishermen and aquaculturists in exchange for a share of fish caught or sustainably raised. Shares can be bought singly, or in a series. Fair Share was founded by husband and wife Jalal Elhayek and Jessica Lattif. They had come from the East Coast, where they had the memorable experience of a dinner featuring a whole cod, courtesy of a CSF (that is, community-supported fishery) in Boston. They expected similar bounty when they settled here. "We were kind of surprised when we came to the hub of progressive food movement and there wasn't a CSF," said Lattif. Customers can choose from sustainably caught albacore and salmon, as well as lesser-known ocean dwellers such as monkeyfaced eel (pole-caught by Mike Dvorak of the fishing vessel High Seas) and sand dabs (net-caught by the slow, gentle Scottish Purse Seine method from Steve Fitz of the Mr. Morgan). Fair Share also keeps track of current news regarding toxicity levels in seafood. One unusual feature of the CSF is that the price of the packages are not determined by market prices, which are higher for some fish and lower for others. "Higher prices incentivize overfishing of certain species," states Fair Share's website. "We believe that equalizing the price of fish across species will reduce this pressure, while also fairly rewarding fishermen for the hard work required to catch, haul, and gut most any type of fish. Shares come in large and small sizes, including a shellfish-free option, and contain recipes and information about the fishermen. The shares can be picked up or delivered. Customers can order for weekend pickup and delivery through FairShareCSF.com. Weekday customers can do the same by ordering through GoodEggs.com. Shoppers can also purchase individual pieces of fish at Fair Share's Wednesday pickup at Three Stone Hearth in Berkeley from 5-7 p.m.
North Berkeley Farmers' Market @ Shattuck Ave.